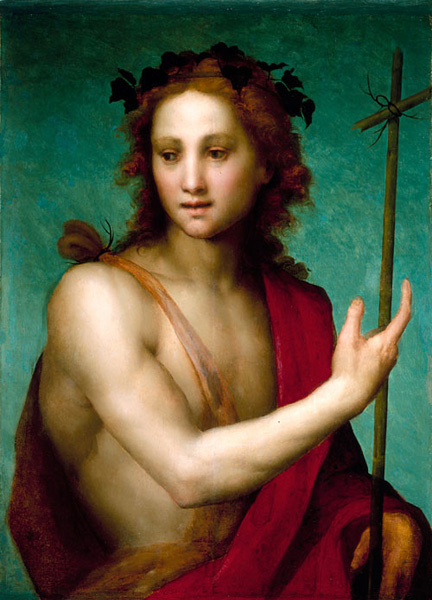 One of the leading painters in Florence during the early sixteenth century, Sarto produced this representation of Saint John the Baptist, the patron saint of Florence, at the height of his artistic career. The graceful design and blending of rich colors reflect the idealized style of the High Renaissance, as does the artist's combination of Christian and Classical traditions. The Baptist appears with his usual attributes, a coarse hair shirt and a pointing hand, which here directs attention to a simple reed cross symbolizing Christ. The crown in the saint's hair alludes to Bacchus, who was considered during the Renaissance to be a pagan prototype of Christ. Similarly, Saint John, the last of the Old Testament prophets, prepared the way for Christ and, like Bacchus, lived in the wild. One of only a handful of paintings by Sarto in America, Saint John the Baptist was brought to this country in the mid-nineteenth century and was for the most part unappreciated until it was rediscovered in 1977 in a church in Worcester.